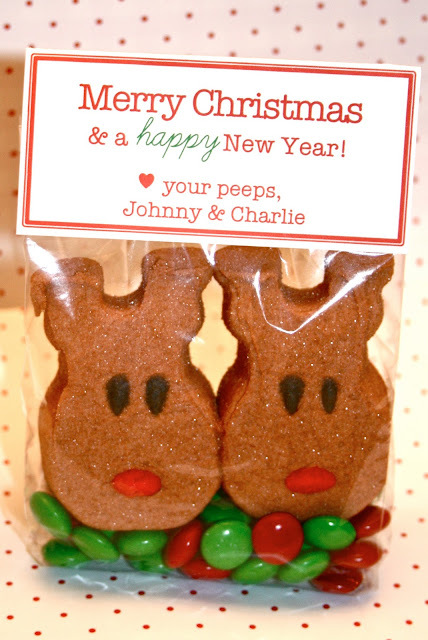 Reindeer Peep Bags are super cute and easy to make treats that everyone will love. They are perfect for the kids in your neighborhood or for your childrens' classmates. Can you sign them from Gabriella and Hunter. p.s. could I re-blog this on my blog? love this for my boys to give to church friends! my email is mistymccaslin@gmail.com and my boys names are Kaden & Brock. This idea is so cute!! Thanks for the inspiration! I love your blog. So glad I found it! Sign them: Your 2012 Peeps! I just found you on Pinterest. Love! Would you please send me the pdf? This is fabulous! I would love the tag. I follow you on Pinterest, Facebook, and your blog. Your blog is my absolute favorite! Too cute!! Could you send to drebolton@gmail.com Thanks so much! Can you send to me as well? Peep. aprilandcjnorman11@gmail.com Thank you! Could you send me your tag as well? merryfields@sbcglobal.net Thanks so much! Hi, can you send me the pdf at kpedersen@westside66.org please with the names Gavin and Bennett? Hi, could you please send me the pdf to jessnicolemorgan@gmail.com with "peep" instead of "peeps" and with the name Rylee Morgan. Thanks. Hi, I'd love to do this for my 2 little peeps this year! Can you please send me the pdf to angelapaschke@gmail.com with Lawson and Autumn? Thanks so much!